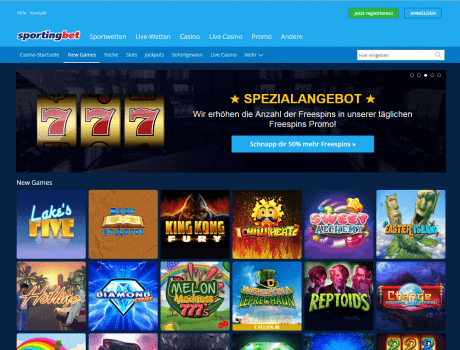 Get exclusive 250€ casino welcome bonus from Sportingbet. To get the welcome bonus you need to make your first deposit during the same day as registration! The value of the bonus is of 100% up to 250 EUR according to the deposit amount. Deposits made through Moneybookers (Skrill) and Neteller don’t qualify from this promotion. The value of the bonus will be immediately credited. To receive the welcome bonus you need to make the first deposit in the same day of the registration. After you have made the first deposit, the bonus will be activated for all casino games from the Sportingbet offer. The bonus is available for 7 days and it can be used to play casino games. The bonus must be wagered 35 times in the selected game. All bonuses which come from this promotion will be available for 7 days. Any unused bonus after this period will be cleared together with any associated winnings. If you have funds not associated with the bonus and bonus money in your balance, the non bonus funds will be used first. Only the bets in the real money mode are taken in consideration for wagering in this promotion.